Bronze sculptures and bronze statues are timeless pieces of art that will be passed down for many generations. 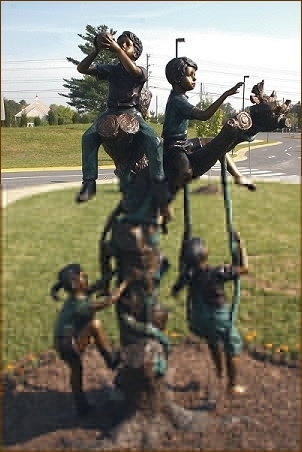 Even our outdoor statues will outlive many generations. The Large Art Company specializes in bronze sculptures and statuary and we carry a wide variety of open edition statues as well as do custom sculpture and casting. We work directly with the foundries that casts our sculptures so we know exactly what goes into them and how they are made. Our sculptures are made from high-quality bronze and are built to last for hundreds of years indoors or out. You will find no paint or dyes on our sculptures. The patina (coloration) is applied by heating the bronze and applying chemicals that literally change the surface color of the bronze. Each piece is done by hand one at a time. Through our global network we can acquire just about any piece of bronze sculpture or statuary being produced today. However, some situations call for a unique or one-of-a-kind piece of work. The Large Art Company can deliver! 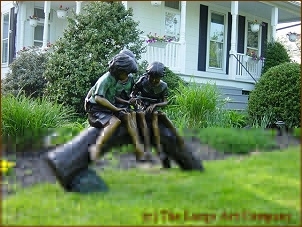 We work exclusively with some of the finest figurative sculptors in the United States. We can handle all aspects of a project from planning to installation. We work with all types of individuals, businesses, organizations, foundations, institutions, government agencies. We are a certified US Government contractor as we are happy to bid on your projects..
Quality and value are equally important at The Large Art Company. You will not find our open edition sculptures sold for less anywhere else. If you do we are happy to match it. Our custom sculptures are done on bare bones mark-ups. 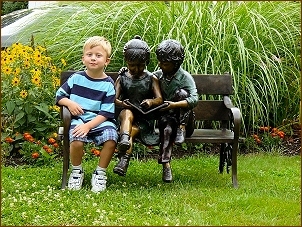 Click here to lean more about our custom sculptures and statues.